Financial Planning: New tools for a cashless society? The act of physically taking cash out of your wallet to pay for something may become a rare occurrence as we move towards being a cashless society. The growing use of cashless channels could affect the way people plan and track their finances in the future, say experts. Today, it is easy to wave your debit card, click a button online or scan a QR code with your mobile phone at many merchants to perform a transaction. Will we be tempted to spend more when making payments becomes so easy? Behavioural economist Dan Ariely has spoken about how the physical act of parting with your cash inflicts more psychological “pain” than paying with a credit card or using other cashless options. Paying with cards, he says, disassociates the act of consumption from the timing of the payment, so the feeling is not as immediate. The cashless trend can be observed in this country. According to Bank Negara Malaysia, the number of e-payment transactions per capita more than doubled between 2011 and 2017 while debit card transactions grew more than sixfold. “If you look at the local payment landscape, you will notice that we have been firmly pushing towards becoming a cashless and cheque-less society for several years now,” says Foo Seik Chiang, head of business transformation at OCBC Bank (M) Bhd. As the cashless trend takes hold, there will be a demand for new financial planning tools. “As more transactions move from offline to online, we will see the need for tools to help monitor our daily expenditure, especially as the payment experience becomes even more seamless and secure,” says Foo. Fortunately, one advantage of cashless payments is that every transaction is recorded. If consumers want to change their spending habits, they can review their expenditure in detail and optimise their budgets using that information. “Today, most banking customers are able to view all of their banking details online. 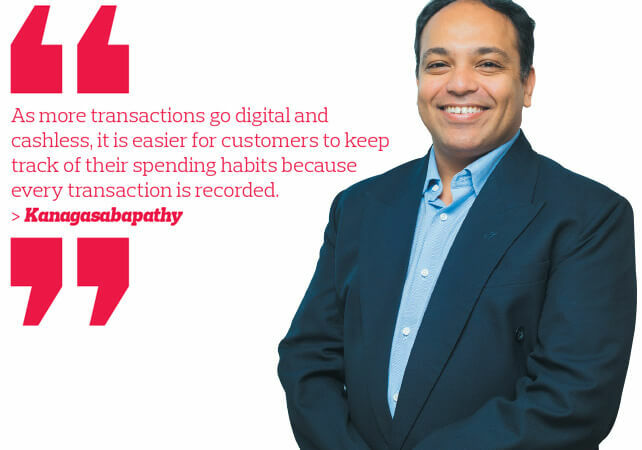 As more transactions go digital and cashless, it is easier for customers to keep track of their spending habits because every transaction is recorded, providing clearer visibility on what they have spent,” says Kanagasabapathy Surendran, head of digital banking at CIMB Bank Bhd. Budgeting apps are already popular in countries such as the US, where cashless payments are more common. Some apps, such as Digit, automatically set aside a portion of your income for savings. There are also micro-investing apps such as Acorn that invest one’s spare change from debit or credit card purchases and platforms such as Mint that allow users to review all of their bank and investment accounts. In Malaysia, there are apps that provide basic services. Bank Negara’s My Tabung app, for instance, is a budgeting tool with functions to record income, expenditure and credit card usage. Some budgeting apps, such as Saved, offer visualisations of one’s expenditure while apps like Money Lover give users access to their accounts at local banks such as CIMB Bank and Maybank. Banks also offer their own apps. 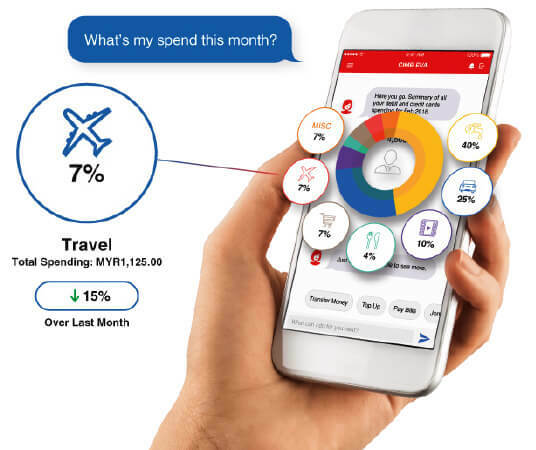 OCBC Bank has Money In$ights — an online platform that analyses users’ spending habits — while CIMB Bank has a chat banking app called the Enhanced Virtual Assistant (EVA). What can banks offer their customers? Banks may be the most obvious source for budget planning tools in a cashless society. 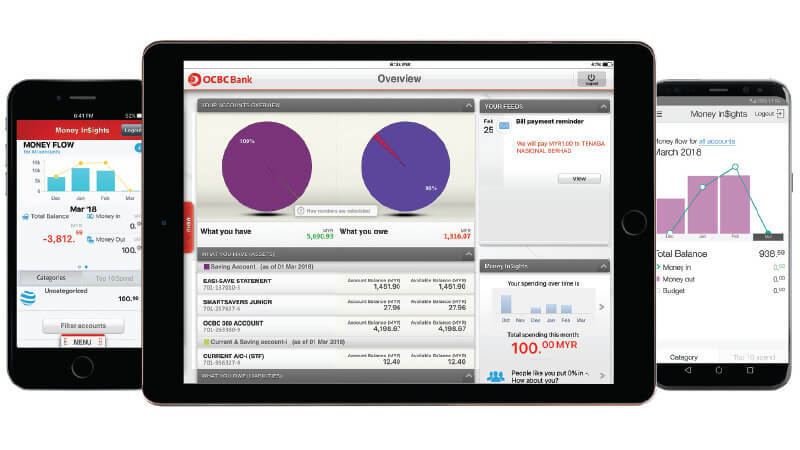 Customers can already see their transactions from their online banking accounts and mobile banking apps. However, some consumers are looking for more analysis into their spending patterns. “From our interactions with customers, market research and feedback from the staff, we know that managing money in real time and on a month-to-month basis has become an important part of our lives. It involves considerable time and discipline on the part of our customers,” says Foo. OCBC Bank launched the Money In$ights platform in 2015. Users can view their spending patterns across months, categories and merchants. They can also compare their habits with other bank customers with similar profiles. The platform provides functions such as budget planning and alerts to notify users that they are over budget. “The idea was to make available to all online banking customers the services of a ‘personal financial manager’, which is something usually reserved for premier banking customers. Back then, it was the first personal finance manager tool to aggregate a customer’s banking relationship holistically via an analysis of their spending habits and money management,” says Foo. Customers do not need to manually input each transaction and category. They can also change the category of each expense to improve the accuracy of the analysis. The platform can differentiate the expenditures made using a credit card from ATM withdrawals, so long as the customer uses an OCBC credit card for purchases and the OCBC debit card for cash withdrawals. “By automating the analysis of their spending, Money In$ights differentiates itself from traditional manual spreadsheet methods or even other money management and budgeting apps by eliminating the need to enter data and making accurate and sound analysis in real time,” says Foo. The bank also noticed that its customers faced a common issue. Many of them opened separate accounts for different purposes, such as marriage, education and holidays. But they ended up having too many accounts to handle, says Foo. “This was simply to ensure that they did not touch their savings. However, this was not ideal as they ended up with too many accounts to manage. With our Savings Goals platform, funds for specific purposes are earmarked within the account and a progress bar moves in line with the customer’s efforts towards achieving his financial goals,” he adds. According to Foo, the bank has achieved a mobile banking penetration rate of more than 40% among its existing internet banking customers as a result of the app. It has plans to expand Money In$ights to other areas of banking as well. “This will include providing market insights and advice to help users make informed investment decisions to grow their wealth,” he says. CIMB Bank added the Spend Analyser function to EVA in February. With the function, customers can monitor their spending habits across their CIMB credit, debit and prepaid cards as well as the online banking platform Clicks. As EVA is equipped with natural language processing functions, it allows customers to chat with it using words that are commonly used in natural conversations. “Many banks have been collating and sitting on a large amount of customer data, but it was only fairly recently that they have proactively looked at ways to utilise the customers’ own data to help the customers themselves. For CIMB, the Spend Analyser under EVA was a natural progression from collating customers’ spending data to presenting the data in a simple manner to facilitate financial budgeting,” says Kanagasabapathy. The Spend Analyser shows a three-month view of spending patterns and through the use of machine learning, EVA fine-tunes its suggestions to the customer by understanding the patterns. Other solutions that the bank is working on will help customers keep track of cash expenses and create bill payment reminders. “In time, EVA’s features will be enhanced to provide real-time data insights to enable highly relevant, on-site, smart promotions to be offered to customers, as well as personalised and customised financial advice based on their banking portfolio and spending patterns. This is how we believe banking can be personalised and made more relevant to customers,” says Kanagasabapathy. Other banks have also introduced planners that help customers automatically keep track of their budgets and set goals, although some are limited to online banking platforms. Eventually, technology such as artificial intelligence can be incorporated into these tools to improve the process, Kanagasabapathy observes. “The modern consumer is generally mobile-savvy and, in many cases, time-poor. Ultimately, all value-added services will depend on how all that data is analysed and contextualised by artificial intelligence, machine learning and rules engines to enable us to offer a value proposition that becomes more and more relevant to the customer as time goes on,” he says. On the other hand, the rise of e-wallets could mean integration with mobile wallet issuers. “The possibility is there to integrate with popular mobile wallet issuers to give consumers a 360° view of their expenditures and digital payments. Any integration should aim to deliver enhanced value to consumers and we strongly believe that a financial management tool such as Money In$ights complements the convenience that one gains from using mobile wallet payments,” says Foo. What do customers want from a budgeting app? Malaysians who have accounts with more than one bank and still use cash in many transactions may have to manually record all their expenses. However, some apps allow users to have access to their bank accounts. This function brings convenience, but users should make sure they read the terms and conditions properly so that their data is kept private and secure. Money Lover, an expense tracker developed in Vietnam, is a budgeting app that Malaysians can use to access their bank accounts. The service is currently available to Maybank, Public Bank, RHB Bank, AmBank, Bank Islam, Hong Leong Bank and CIMB Bank customers who subscribe to the paid version of the app. One of its features is allowing users to take a picture of their receipt to automatically record the expense. However, there are apps such as Saved that require each expense to be manually keyed in. The app is developed by local software company Snappymob Sdn Bhd and is only available for Apple devices for US$4.99. The company launched its third version of the app, Saved 3, in December last year. For the time being, it does not allow multiple bank accounts to be linked as the service is not integrated with those of financial institutions. The first version of the app was launched in 2013. Snappymob CEO Allen Ding says the idea was hatched when the founders were looking for good solutions to track their finances. One of his former business partners tracked expenses using a complicated double entry model and was passionate about creating simpler personal finance tools. Ding was using a budgeting app that was tough to navigate and was not aesthetically pleasing. When Saved was launched, it was featured by the App Store and the promotion helped it to gain traction. The company has added various functions over the years in response to user feedback. “We added the tracking income feature. Then, we added another mode for visualising the expenses, which is more of a calendar-type view that we call a heat map,” says Ding. On the calendar view, there are spots of different colours to show the level of expenses for each day. Snappymob plans to add features such as recurring expenses and access to multiple accounts for couples. Eventually, it will try to integrate the app with the services of financial institutions and payment providers as the manual input of expenses can be a chore, says Ding. “It is tough because we need to talk to the banks. There is no open data initiative for personal financial data, which they have in other countries,” he adds. Other sources of data that the company would like to incorporate include that from the Employees Provident Fund and mobile wallets. “The thing about integration is that either you integrate via the banks giving you access to data or you get around it by a lot of hard work, scraping information from users’ accounts with their consent. But that is where we will try to see if we can set up some pilot projects with these institutions,” says Ding. The transition to a cashless society should not affect those who have developed sound saving and investing habits, say financial planners. They believe that despite the ease in making payments, individuals are still able to control their spending if they follow the basic principle of saving. In fact, with digital tools to keep track of their budgets, meeting their financial goals should become easier. “While there will be differences in the way we manage money, things should not really change too much. It is worth pointing out that we should continue to manage our finances using the so-called ‘money bucket concept’, where one bucket is for transactional funds, another is for your savings and the third is for your investments,” says Felix Neoh, a licensed financial planner and vice-president of client advisory at Whitman Independent Advisors Sdn Bhd. Not everyone needs to record every single transaction through an app or even on paper as long as a fixed amount of money is set aside for each bucket, he adds. “I have been tracking my expenses for the longest time. I still have the notebooks from my university days where I filled in the ‘In’ and ‘Out’ columns. So, I can literally tell you how many movies I went to when I was in university. It is my natural tendency to do that. Of course, a meticulous report on each expenditure would help someone trying to optimise his spending. “The advantage of those who track their amounts closely, though ridiculous and tedious, is that they can do anything in terms of trying to optimise [their saving and spending habits]. If you don’t know where the money is going, how am I going to ask you to spend less?” says Neoh. However, whipping out your phone to record every transaction can become frustrating. “Tracking your spending is not the easiest thing to do. An alternative is to focus more on savings and investments,” says Neoh. Nina Othman, founder of Grow the Goose, a social enterprise that teaches children financial empowerment, tries to instil the concept of saving in children at a young age. She believes that with sufficient financial education, the transition to a cashless society should not warrant any new planning strategies. “We use the jar system. There is the Goose jar, which is the money you do not touch until you are 18. That is for you to achieve your dreams faster. There is another jar for you to learn and upskill yourself. And then there is the Play jar for you to buy toys and watch movies. The last one is the Give or Help jar,” says Nina. She observes that children nowadays are already exposed to cashless payments. For example, some international schools give each student a card that the parents can load with money for them to use in the canteen. Many parents also give their children supplementary debit cards, where they can monitor their expenditure. “It is just changing the medium of transaction, but not the concepts,” says Nina. Her observation of how a cashless society could work came from a recent trip to Sweden, where she noticed how the people there used the Swish mobile payment system. “With just your phone number, you can transfer funds from account to account. You go to the market and buy vegetables, for example, and it is all paid by card,” she says. When she asked how they kept track of their spending patterns, they told her that they use tools such as expense trackers. “For them, it is already a habit to track expenses. Apparently, a long time ago, they were fed with financial education through a free comic strip that had two characters — Miss Spend and Miss Save. They were introduced to this at a young age, so they know how to track their own expenses,” says Nina. The issue of bad financial management among Malaysian youths can be attributed to poor financial literacy, she observes. That is why she suggests that financial education be included in the school syllabus. “I think you can do whatever tech-wise, but it won’t work if the habits and culture are not instilled in you at a young age,” says Nina.